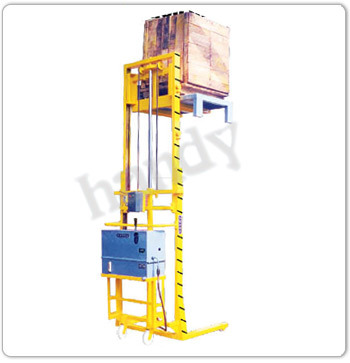 "handy" Pallet stackers can be tailor-made to suit customer's special requirements for heights up to 2 -3 meters. "Handy" Pallet stackers can be used for loading/unloading the pallet & stacking the same in godown at different levels in two or three layers. 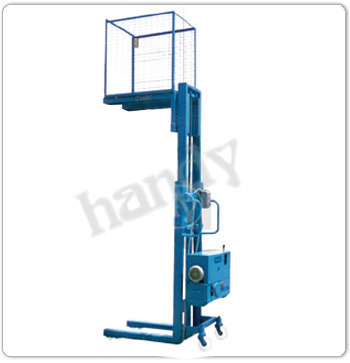 Short light strokes of the handle speedily lift the rated capacity load. Conveniently positioned wheel valve allows the operator to control the lowering speed with a stepless movement, hydraulically cushioned. For quicker and effortless lifting, power/Battery operated lifting is also available. The lifting and lowering motion is powerised and the horizontal travel is by hand. The power pack is provided with standard components and accessories. In Battery ----- operated lifting a high capacity 24 volts battery is placed over the stacker which supplies current to the power pack located over the battery, which obviates the necessity to provide flexible cable which moves along with the stacker in the hall. The horizontal travel is by hand in this version too.